Catering is the business of providing food services at remote site or places such as hotel, public house or any other location. Catering has become a lucrative business that is not just restricted to dinner parties. Today the scope of catering services has grown beyond these dinner parties. Catering services are provided in many occasions and events. Besides serving food, they offer different services. With the foods options spanning dozens of menus, sometimes we often find catering somewhat overwhelming for our kind of events. There are different types of catering services that cater to different types of clients and their events. All catering services can be categorized as either on-premise catering or off-premise catering. On-premise catering involves function held on premises of clients like client’s home, backyard, etc. where food, staff and kitchen tools are all transported to the site. Off-premise catering involves preparing food at the central kitchen and delivering it at client’s location. In most cases, there is no existing kitchen facility at the location where the food is served. Picnic catering is one example of off-premise catering. Corporate catering does not mean office parties and get-togethers only. It also involves offering breakfasts and lunch to employees. Corporate catering in different hours has different menus. Such services are generally reasonable and timely for company’s employees. Breakfast may include fresh fruits, sandwiches, pastries and so on whereas lunch menu may include meals, soup, salad, etc. This is a specialized form of catering business. 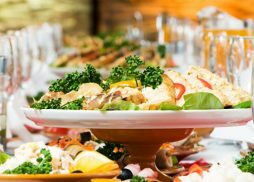 The wedding catering involves not just food being served but also the established caterer can provide help with wedding planning that is within budget. The wedding caterer can be hired independently or can be a part of entire package. Seasonal or sporting major public events all fall in this category. Planning for these takes a pro to make sure you have all the right menu choices for your audience. Here you will find all the crowd favorites from hot dogs and hamburgers to chili cheese fries and ice cream. From birthday and retirement parties to big backyard BBQs, social events cover wide range of events and of course food. Appetizers, bartenders and balloons are just some of what you might see catered at events like these. This type of catering refers to the provision of food and beverages to people engaged in ‘rest and recreation’ activities. It involves providing food services in mobile way at locations such as concerts where the food is served directly from a vehicle, cart or truck. Merchant ships often carries catering officers especially ferries, cruise liners and large cargo ships. In fact, catering has been in use in marine world long before it became a land bound business.